Illinois Replevin Law: Who Gets to Keep (Broken) Engagement Ring? The (diabolical?) Joey Greco (I think that’s the ‘Cheaters’ Host’s name) would love this one. In Carroll v. Curry, 912 N.E.2d 273 (2nd Dist. 2009), the plaintiff filed a replevin suit against his ex-fiancée (defendant) seeking the return of an engagement ring that he previously bought. The couple was engaged to be married for several years until the defendant broke it off after she accused the plaintiff of cheating. After kicking plaintiff out of their home, the defendant refused to return the ring since plaintiff’s infidelity caused the relationship to end. Plaintiff filed a replevin suit to get the ring back and eventually moved for summary judgment. The trial court granted the motion and the defendant appealed. Held: Affirmed. Plaintiff gets the ring back. 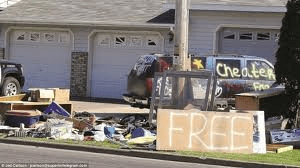 Siding for the plaintiff, the Court noted that replevin is a strict, statutory proceeding that does not look at the concept of “fault.” This means a court will not look at the underlying reasons why someone refuses to return an item of personal property. The primary purpose of the replevin statute is to test the right of possession of personal property and place the successful party in possession of the property. 735 ILCS 5/19-101. A replevin plaintiff must prove he is (1) lawfully entitled to possession of property, (2) the defendant wrongfully detains the property and (3) refuses to deliver the possession of the property to the plaintiff. “Wrongful” in the replevin context doesn’t mean immoral or “bad.” It’s wrongful in the legal sense; meaning one person has a superior right to an object over the other. Normally, the replevin plaintiff must make a demand for return of the item. However, where a demand would be pointless (“demand futility”), the plaintiff is excused from the demand requirement. The court then rejected the defendant’s argument that plaintiff’s infidelity was the reason for the break-up. Delving into fault-based inquiries, the court said, would mire it in examining parties’ subjective motivations as opposed to objectively deciding who has a better claim to possession of an object. – Occasionally, where there is fraud or unjust enrichment, equitable considerations can factor in a replevin case. Here, however, since the plaintiff paid for the ring, there was no unjust enrichment in allowing him to reclaim it.